Routine seems to have gone COMPLETELY out of the window lately, I mean me & Flopsy girl ALWAYS knew where we were with things. 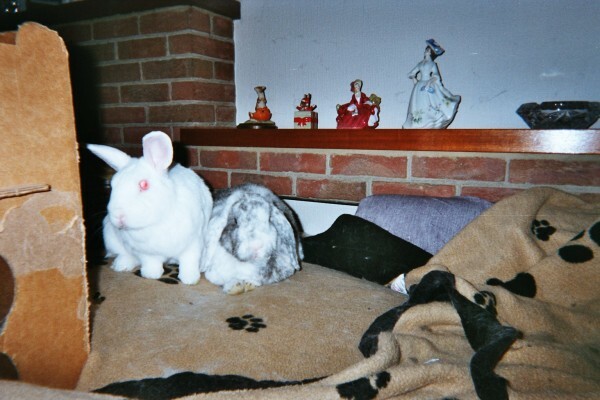 The 2 foots would come home, let us out for a few hours, then they would put us back in the cage, and then go to bed. Routine, it worked, it was fine. Lately though, we seem to be enjoying more freedom, but it does not seem as though it is planned, I mean take last night for example. One of the 2 foots comes home, lets us out, and feeds us (ok so far). Then, he goes out, collects the other 2 foot, and returns home, but instead of settling down & having something to eat like they usually do, they were pacing around, and obviously waiting for something. Eventually, another 2 foot arrived, and started looking at the big white thing that is supposed to keep the house warm (although it has not worked for ages, I don't know why they are wasting their time). This new 2 foot only stayed for a little while, and then left, so then, my 2 foots started cooking food, and doing jobs & stuff..... I'm rambling aren't I? OK, cut to the chase. One of the 2 foots stayed up with us all night, so we did not have to go back in the cage, but what is even MORE unusual, they both went out this morning (and we have not seen them since), and STILL did not put us back in the cage. DECISION TIME...... Do we behave, or do we wreck the house?